Sep. 30, 2017 7:00 a.m. 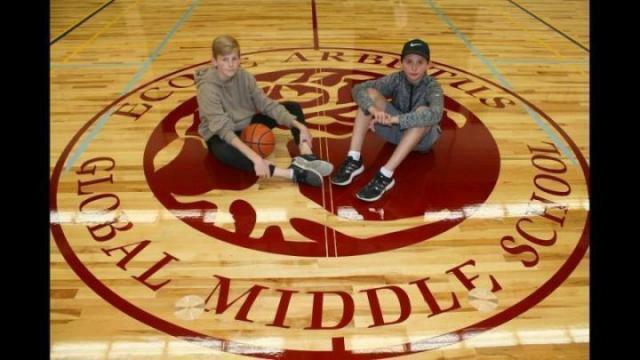 The gymnasium floor that Steve Nash once dribbled across at Arbutus Global Middle School has been replaced. And players from the new team can’t wait to use it. On Wednesday the school held an assembly to celebrate the $200,000 flooring project. “The old floor was coming apart, pieces were coming up,” said Zak Gershman, who will star on this year’s Grade 8 Arbutus Avalanche team. “Last year you would slip, there was a lot of dust, every time you ran down the floor you had to wipe the bottom of your shoes,” said Marcus Jensen, who’ll also be on the Grade 8 Avalanche. Gershman and Jensen were the first to use the court, playing a brief game of one-one-one Wednesday morning. “They’re the first students to even see it, we had papered the windows of the doors in September while the sealant cured,” said Arbutus principal Rob Parker. The shiny new hardwood maple replaces the original flooring installed when the school was built in 1970. “It was sanded to the point it couldn’t be sanded anymore,” Parker said. The school will add new electric bleachers in October, as the old wood bleachers became difficult to unfold. Arbutus’ gym will be used for basketball and volleyball, and has several user groups.